U.S. officials are separating undocumented children who cross the southern border with their parents at a faster rate than the government had previously acknowledged, data provided to reporters by immigration officials on Tuesday shows. In the 35 days from May 5 to June 9, some 2,342 children -- an average of 67 a day -- were separated from their parents or custodians as the adults faced federal criminal charges for entering the country illegally, as well as deportation proceedings, as a result of a new policy the Trump administration refers to as "zero-tolerance." Numbers provided by the Department of Homeland Security late last week indicated that between April 19 and May 31, 1,995 children were removed from their parents and held in government-funded shelters, averaging roughly 48 separations a day. U.S. Attorney General Jeff Sessions speaks at the National Sheriffs' Association convention in New Orleans, June 18, 2018. Those dates roughly coincide with when Attorney General Jeff Sessions announced the policy on April 6, and when DHS - which includes U.S. Customs and Border Protection - joined the initiative on May 7. VOA has requested additional data on separations from DHS that coincides with those key dates of the initiative. 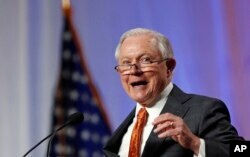 Sessions ordered that all migrants crossing the border illegally be swiftly placed into federal criminal court proceedings for illegal entry into the country. With parents or custodians detained on federal charges, according to DHS the children cannot accompany the adults to those facilities, and are rendered "unaccompanied minors." They are then placed in the custody of the Department of Health and Human Services, which contracts out to non-profits; those organizations are in turn are running shelters to hold the children, some of which are younger than 4. An audio recording made inside one such shelter by investigative news outlet ProPublica revealed wailing children pleading for their parents. A request for information on the number of reunifications or deportations that have taken place since the policy was announced in April was not immediately provided on Tuesday's call with DHS officials; a subsequent request by VOA for that data has not yet received a response. 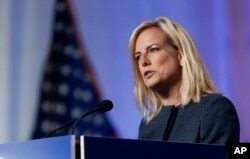 Sharp criticism followed the recent decisions by Trump and his Cabinet officials, who have at times referred to the policy as a deterrent to border crossers, but also denied that it could be considered a "policy," as DHS Secretary Kirstjen Nielsen said at the White House on Monday. In a strongly-worded statement Monday, United Nations High Commissioner for Human Rights Zeid Ra’ad al-Hussein denounced the US policy. “The thought that any state would seek to deter parents by inflicting such abuse on children is unconscionable,” al-Hussein said.